It was almost Friday. I had just walked in my front door after a long day at work when my phone rang. It was my friend, Stephanie: Did I want to get together tomorrow for an impromptu potluck with a few of our friends? I told her I was in, but in the back of my mind, I was wondering what I could throw together to bring with me. Then I had an idea: Pasta salad to the rescue. Yes, I know what you’re thinking: Pasta salads can be expensive. By the time you buy that fresh mozzarella, you can set yourself back a good chunk of change. Or maybe you’ve sabotaged your wallet buying pasta salad from the deli, which costs way more than anticipated. It doesn’t have to be that way. I’m sharing with you three pasta salad recipes you can make with six ingredients or less — and cost less than $12. Each salad takes just 25 to 30 minutes to prepare, then just toss them in the fridge for two to three hours to cool. This is one of my favorite pasta salads. I used to work in a deli and would serve this all the time. I eventually got sick of paying $5.00 for a 1-pound container, so I decided to see if I could make it myself. After a little tweaking, I had perfection. Cook the rotini according to the directions on the package. Drain the cooked rotini and rinse it under cold water. While the pasta is cooking, cut tomatoes into bite-size pieces and chop the spinach. Next, heat the precooked bacon according to the directions on the package and let it cool for a few minutes. Pour the cooled pasta into a large bowl, then add the tomatoes, spinach and bottle of ranch dressing. Mix it well. Add crumbled bacon and mix it again until it’s incorporated. Cover the pasta salad with plastic wrap and place it in the fridge to chill for two to three hours. This is another easy salad to make — you don’t even have to cook the chicken. Cook the rotini according to the directions on the package. While the pasta cooks, pick the meat from the chicken — discard the bones and skin — and chop the spinach. Once the pasta is done, drain it and rinse it with cold water. Next, put the pasta, chicken and spinach in a large bowl. Add 1.5 bottles of Caesar dressing and mix. Cover the pasta salad and put it in the fridge for two to three hours to cool. If you love tacos, you will love this pasta salad. Cook the rotini according to the directions on the package. While the pasta cooks, open the black beans and corn, and drain them. Drain the pasta and rinse it with cold water. Put the pasta in a large bowl and add the jar of salsa, black beans, corn and 1 tablespoon of the taco seasoning mix. Add cheddar cheese and mix all ingredients together. Cover the pasta salad and place it in the the fridge to chill for two to three hours. Now, sit back and relax. The next time you get that phone call for a gathering on short notice, you won’t be in a panic. 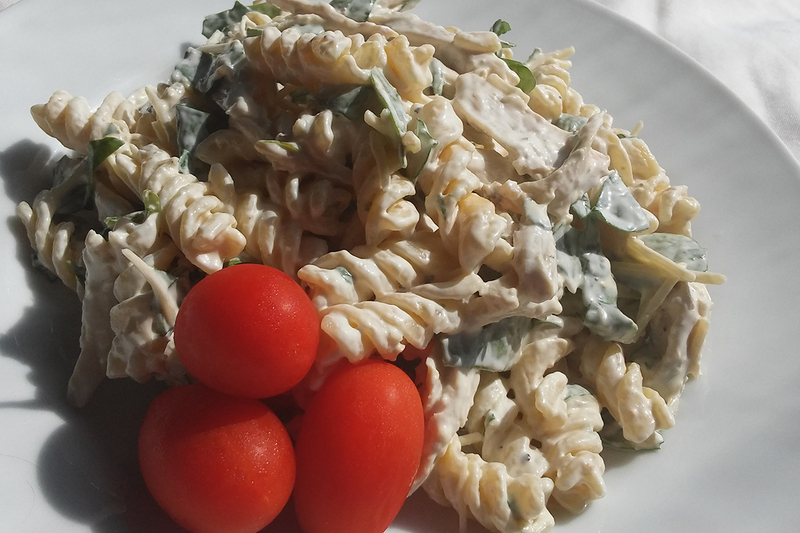 You have three delicious pasta salads you can make in a snap without breaking the bank. You can even make all three recipes for less than $30, giving guests several options to choose from. Carrie Lowrance is a freelance writer and author. She has been featured on Huffington Post, Bon Bon Break, Crosswalk, etc. She has also published three books of poetry and one children’s book, Don’t Eat Your Boogers (You’ll Turn Green). You can connect with her on her web site www.freelancebylowrance.com.